Late summer is a time of heat and humidity, a combination that can cause blood circulation to increase on the surface of the body and decrease in muscles and organs. According to The Five Element Theory, this time of year is dominated by the earth element and governed by the spleen. Deficiency in spleen qi and low blood pressure may result in a lack of energy, dizziness and sluggishness. Ayurveda states that our digestive fire, which is already low due to the high temperatures of summer, is weakened further by high humidity, causing all doshas to become out of balance and ama (toxins) to accumulate in the digestive system. 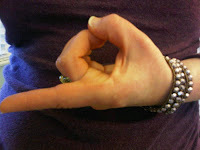 To stimulate circulation and energy in the spleen, try the following hand mudra. Press the thumb on to the side of the middle fingernail. Press the ring fingertip on to the other side of the middle fingernail. Press the little finger to the side of the ring fingernail. With all these fingers in position, extend the index finger. Do this with each hand 3x a day for five minutes.